The worst-kept secret in Naypyitaw, the eerily under-populated capital of Myanmar, is who lives in a new bungalow in its dusty northern suburbs. The house looks unwelcoming, and perhaps it’s meant to. It is painted a penitential shade of beige and ringed by a high fence topped with razor wire. “To protect against enemies,” said a guard through a mouthful of betel juice, before shutting the heavy wooden gate that separates Naypyitaw’s famous new resident, Aung San Suu Kyi, from a curious world. Suu Kyi rented the house after she and 42 other National League for Democracy (NLD) candidates won seats in April by-elections. I visited Naypyitaw twice to research my Special Report for Reuters on the Nobel Peace Prize laureate. The parliamentary complex is, like the city itself, sprawling and half-deserted. Suu Kyi walked its well-polished hallways with a slow, loose-limbed stride not often seen in public, where her bodyguards must hustle her through media scrums, and where fans sometimes lunge or yank her aside. She seemed at home there. 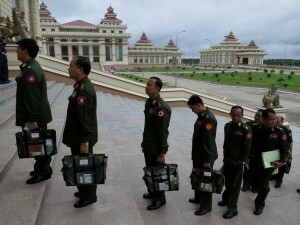 In Myanmar’s half-cocked democracy, the constitution reserves a quarter of parliamentary seats for military delegates. Most are mid-ranking army officers, all are men. They keep their distance from Suu Kyi, and not only because she wants to re-write the constitution and eject them from parliament. They’re also star-struck. “They want to make friends with her, but they are a little shy,” said NLD spokesman Ohn Kyaing.